Win Royal Rumble 2019 on Blu-ray! 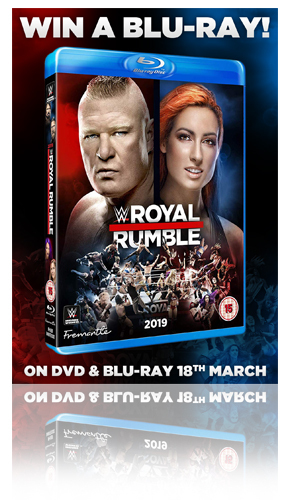 To celebrate the Blu-ray and DVD release of Royal Rumble 2019 (available to buy from Monday 18th March) - we are giving away a Blu-ray to one lucky winner! It’s the Royal Rumble – the first major event of 2019 for WWE, the most anticipated match of the year, and the first stop on the road to WrestleMania! And for the second year running WWE holds TWO 30-superstar over-the-top-rope Royal Rumble matches, with both the men’s and women’s divisions competing for title shots at WrestleMania! Meanwhile Brock Lesnar defends the Universal Championship against Finn Bálor, WWE Champion Daniel Bryan takes on AJ Styles, and there’s great women’s action from Ronda Rousey, Becky Lynch, and Sasha Banks. Plus much more! The Royal Rumble is always one of the most exciting nights of the year in WWE and sets the stage for WrestleMania. And the 2019 edition of the Royal Rumble turned up the excitement even further with one of the best top-to-bottom cards in the event’s history! Most exciting of all are the hour-long Royal Rumble matches, with the winners of both going on to face a champion of their choosing at WrestleMania! As ever the matches are packed with surprises, daring escapes, and edge-of-your-seat eliminations. And you won’t believe what happens in the dramatic final minutes of both action-packed Royal Rumbles! Ronda Rousey faces her toughest challenge yet against “The Boss” Sasha Banks, while Asuka and Becky Lynch dazzle the crowd with their intense matchup. Daniel Bryan and AJ Styles put on a technical clinic in the next chapter of their heated rivalry and there’s a modern-day David vs Goliath story when Finn Bálor tries to topple “The Beast” Brock Lesnar! At almost five hours long – plus all the matches from the kick-off show included on the extras – the Royal Rumble gets 2019 off to a huge start in WWE! Don’t miss out! Where did the Royal Rumble take place? © 2019 Fremantle Home Entertainment. All rights reserved. Competition closes on April 9th 2019.